Earlier today, looking for news on talented French singer Camélia Jordana, I find a record that passed me by completely unnoticed and which I loved at the very first hearing. It’s a compilation of standard jazz made by musician and judge of Nouvelle Star contest André Manoukian. I know, I know, who needs just another compilation of that kind, but, this one is worth the while, I promise. 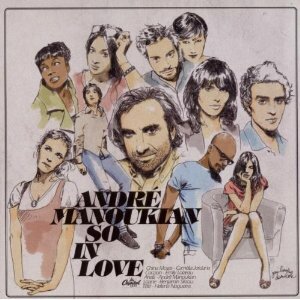 The record, called So in Love, was released in 2010 and gathers voices of a bunch of my favorite French artist: people like Emily Loizeau, Anaïs, Helena Noguerra, the duo Cocoon and, of course, Camélia Jordana, already mentioned above. The second track of the CD already got me hooked with a beautiful fresh version of the great classic Cheek to Cheek, written by Irving Berlin and immortalized by Ella Fitzgerald and Louis Armstrong. The record’s version is interpreted by Anaïs, who gives it a breeze of fun renovated air to the song. Anaïs is also responsible for singing Crazy. Camélia Jordana sings What a wonderful world, by Louis Armstrong. Loane got the difficult task of singing Every time we say goodbye, by the great Cole Porter and, although she plays safe when singing “(…)from major to minor” (and we simply can not compare to Ella Fitzgerald, since she was so incredible one could think she was an Alien), I really enjoyed the version. And last, but not least, the fun Emily Loizeau closes the record singing Tea for Two.